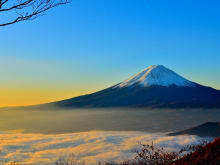 We can take you to another wonderful area of Japan with a comfortable bus. If your destination is not on our list, please request us! Nice contents! I rented climbing boots and poles. It saved me so I think it’s well worth having the equipment rental package. This tour includes delicious meals, I ordered vegetarian one for a day and both of them are delicious. This tour is overall very good and seemed to meet everybody’s needs. I wasn’t sure how I could possibly make it to the summit of the highest mountain in Japan as a first-time hiker not being able to speak Japanese. I’m so glad to find this tour, offering good support and English-speaking guide. I could also experience and learn a bit about Japanese culture and history. The guide lead us at a comfortable pace and the hot spring was so good to heal my tired body from the hike. If you are worried about the hike, try this tour because I did it! I’m so glad to experience this tour. It was so much fun and educational. The guide taught us about history and culture of Japan. I thought hiking was just a physical activity but knowing the background of Mt.Fuji made my trip more meaningful. Thank you so much. I recommend this tour and I would try another tour with Voyagin. I enjoyed and am satisfied with everything of this tour that I highly recommend it and I’m gonna come here again for sure. Although it was a little bit chilly and I didn’t have much experience of hiking, the guide was so knowledgeable and kind that I was very confident to reach the summit. The view form the top is definitely unforgettable! Not only the Mt.Fuji part, but the entire trip was very good. Stay was comfortable enough, meals were good, and hot spring was so relaxing after the hike was done! !